Our time in Coventry Basin was up. No other boat had appeared since our arrival and we were the only private boat in the basin. We had a few concerns about being moored there on a Friday night but all was well. Perhaps due the the frequent showers! After doing all the pre-start checks we headed…. nowhere. Until I had made another of those interesting trips down the weed hatch to remove a large number of dead urban jellyfish from the prop shaft. It was a slow trip back to the moorings opposite the Ricoh Arena in an effort to avoid accumulating more of those pesky jellyfish. When there are no leaves on the surface the water is quite clear. It’s amazing what people throw into the canal. At the Ricoh Arena moorings the edge was so shallow we couldn’t get against the bank. Jan had to get off at the bow and I jumped from the stern. It was sprint around the aisles with me pushing the trolley and Jan holding on for grim death. I’m not much of a browser in supermarkets. Jan stowed all the vittles whilst I steered Waiouru to Hawkesbury Junction. There were patrons outside the Greyhound so I made sure I didn’t stuff up the turn. We haven’t seen a moving boat for two days and yet we met one at the stop lock. 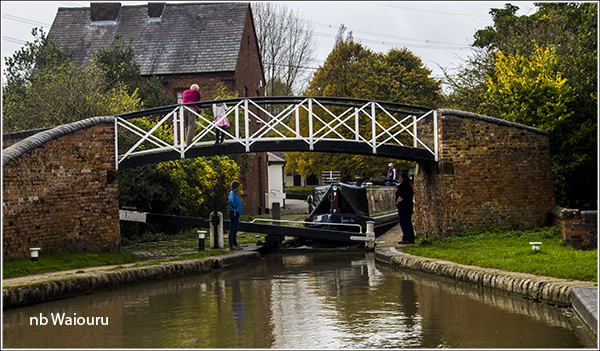 It was in our favour so we went through and then moored on the water point…. but only to fill the tank. A boat appeared from behind whilst the tank was filling and Jan said she thought she recognised it! Jan wandered back to confirm her distant observation. She was right! 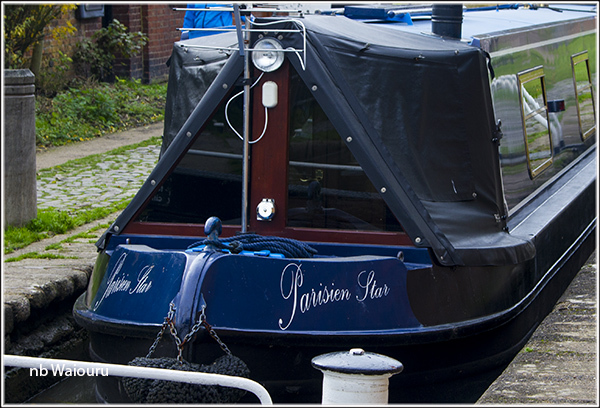 Parisien Star her new owners are still enjoying her. Once the water tank was full we crossed to the other side of the canal on a good 7 Day mooring. We’ll be here tomorrow as the Sunday roast at the Greyhound is beckoning. We’ve been spoilt this week. Four meals at the Greyhound! How nice to see a photo of PS! You're the second boaters who have seen her this last week that we've heard of. Good to see she is looking well loved. Four meals in The Greyhound this week eh? One of our very favourite pubs in the world. I love people watching there nearly as much as I love their food. I know Lisa. Four meals is indulgence. But nothing is too good for my girl. Although I have explained we now can't eat there again until 2020.